The Western Wall and the Church of the Holy Sepulcher, both located in Jerusalem's Old City, are the holiest places on earth for two major religions. The Western Wall is from the end of the period of the Second Temple, having been built by Herod the Great in or around the year 19 BCE. Other parts of the wall were added dating from the 7th century CE. The Church of the Holy Sepulcher is revered by Christians as the place where Jesus was crucified, and the site where Jesus was buried. Built in the 4th century CE by the orders of the emperor Constantine, it has attracted pilgrims steadily ever since. A 187-foot exposed section of the ancient wall located on the western side of the Temple Mount is what is referred to as the Western Wall. This part of the wall faces a plaza and is designated for prayer. Much more of the wall runs for another 1,600 feet behind residential buildings along its route. 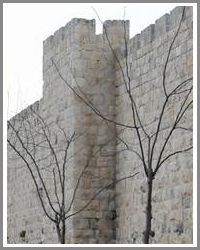 The wall was built by Herod to support the renovations to the Temple that he ordered around the year 19 BCE. The Church of the Holy Sepulcher was built in or around the years 325 and 326, under the direction of the emperor Constantine and under the supervision of his mother Helena. It had been a temple to Aphrodite previously. It was destroyed and repaired many times in the intervening centuries, and today is under the control of several Christian churches. Both the The Western Wall and the Church of the Holy Sepulcher are two of the most heavily-visited pilgrimage sites in Jerusalem. Even for the non-religious, the stunning amount of history these two holy sites have seen are the source of fascination and reverence. For those who visit these sites as a religious pilgrimage, the experience can be profoundly life-altering.